Wow, and just like that, we’re already halfway into Year 2 of Project Pteropus! 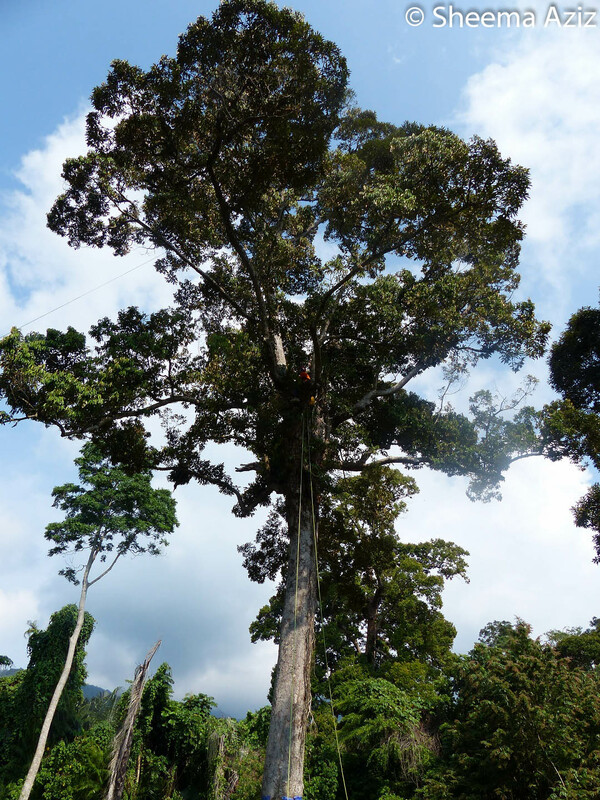 We’ve been quite busy on Tioman, what with faecal sampling and phenology monitoring now taking place on both east and west sides of the island. We also have some very good news to share: the project will be able to keep going for the rest of the year, as the Rufford Foundation have awarded us a small grant – which we are enormously grateful for! Meanwhile, it’s high time for another photo update. 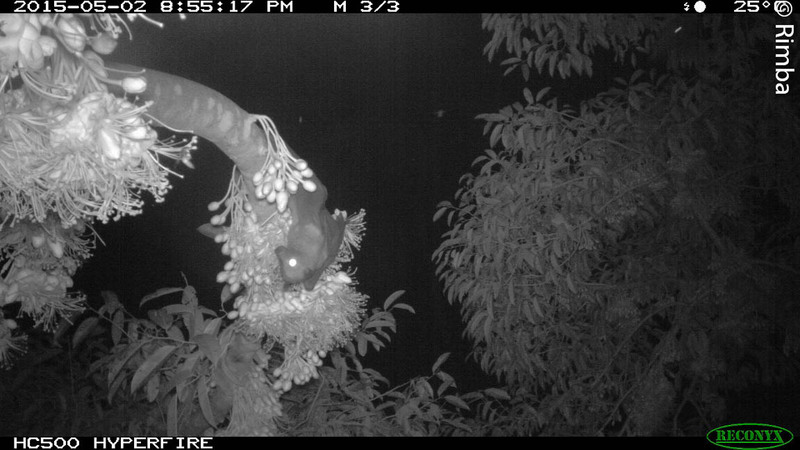 Back in late April and early May, we put some Reconyx camera traps and Bushnell video traps up in some flowering durian (Durio zibethinus) trees. 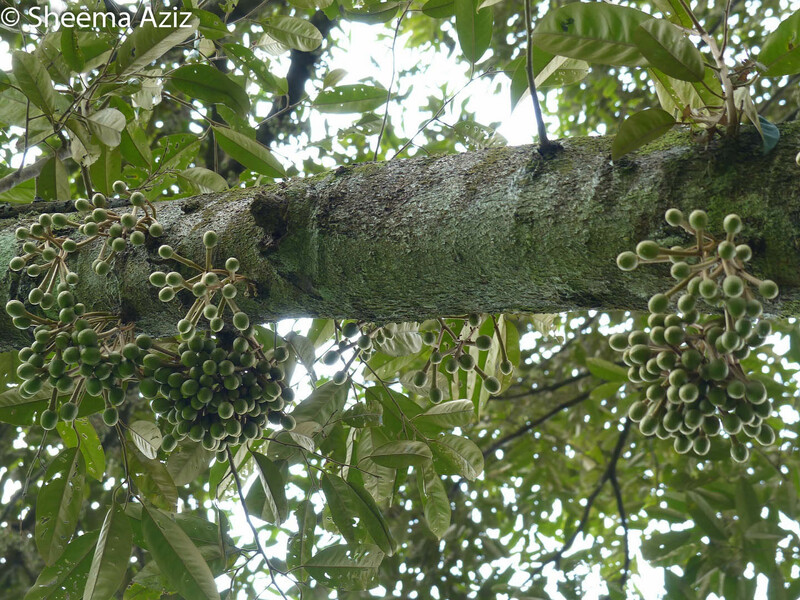 This will help us study the durian’s pollination ecology better – what animals visit to feed on the flowers, and how each species in this complex network plays a role, and interacts with the others, to influence pollination success and fruit development. 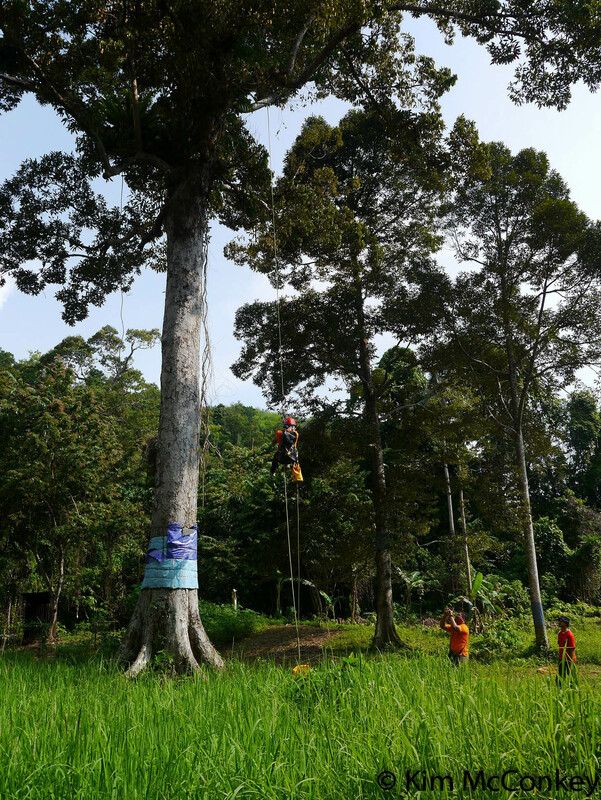 It’s also a start in answering the question of whether flying foxes help to pollinate durian trees. This is an extremely complicated bit of research, and we wouldn’t have been able to do it without Dr. Sara Bumrungsri and his PhD student, Tuanjit Sritongchuay (Dr. Bumrungsri’s study discovered that the nectarivorous bat Eonycteris spelaea is a principal pollinator of durian in southern Thailand). 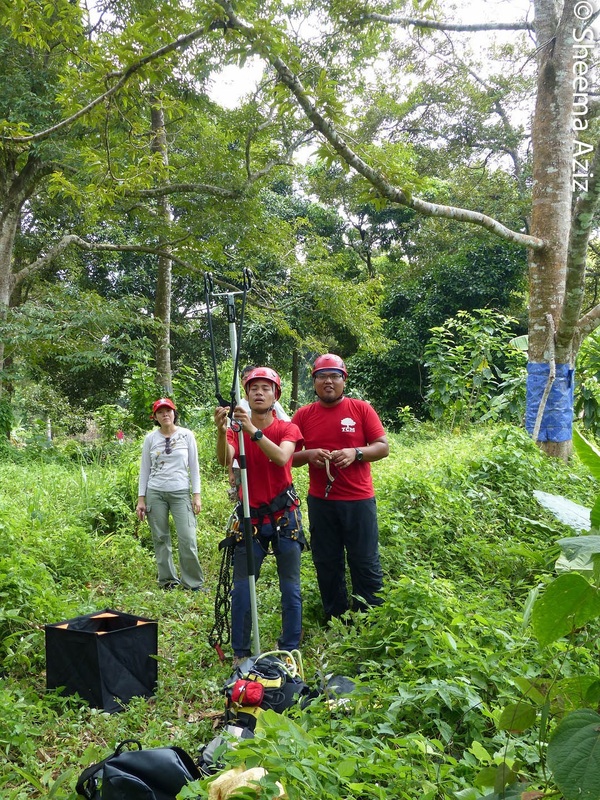 They kindly entertained all of Sheema’s questions and requests, and were extremely generous hosts when Sheema visited their lab at Prince of Songkla University – where they taught her more about durian ecology and pollination studies. 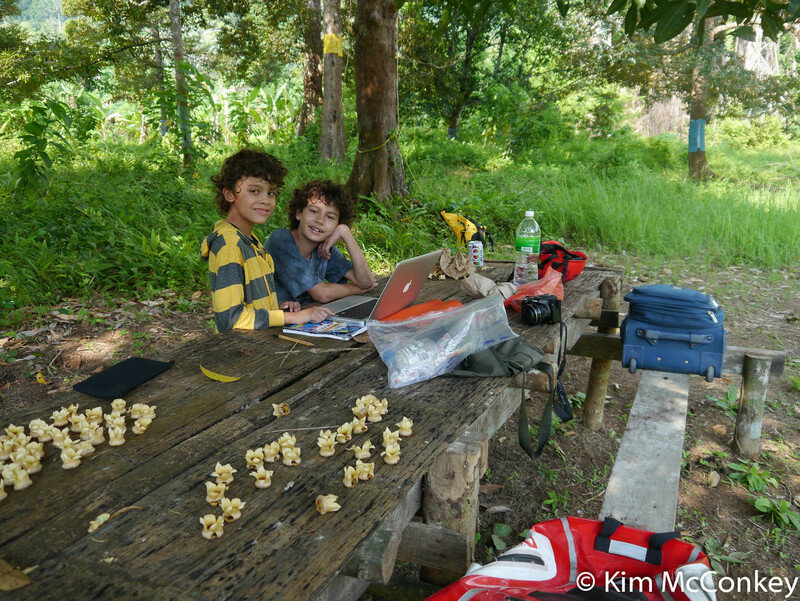 Mak Long Hapsah and Pak Long Awang from Kampung Juara have generously allowed us to use their durian orchard for our study. 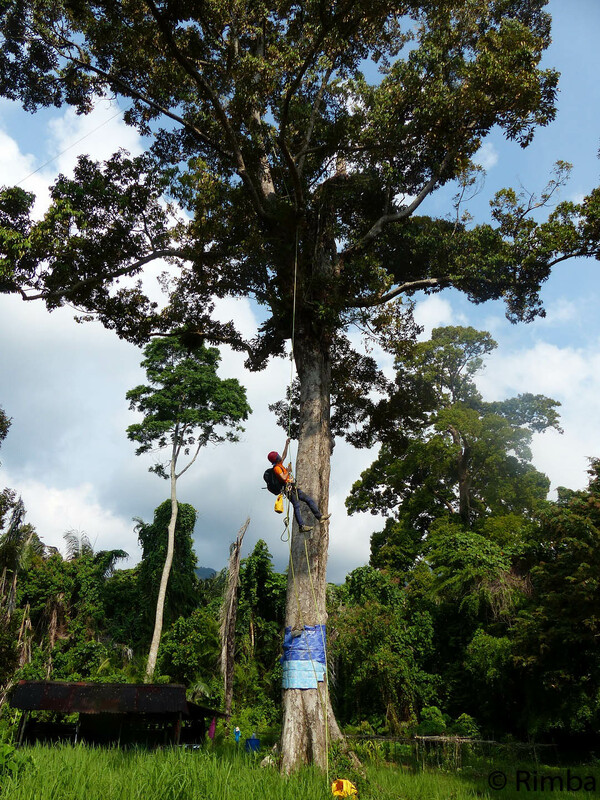 As their trees are already quite old and tall – ranging between 15-25 metres high, we couldn’t climb them ourselves. 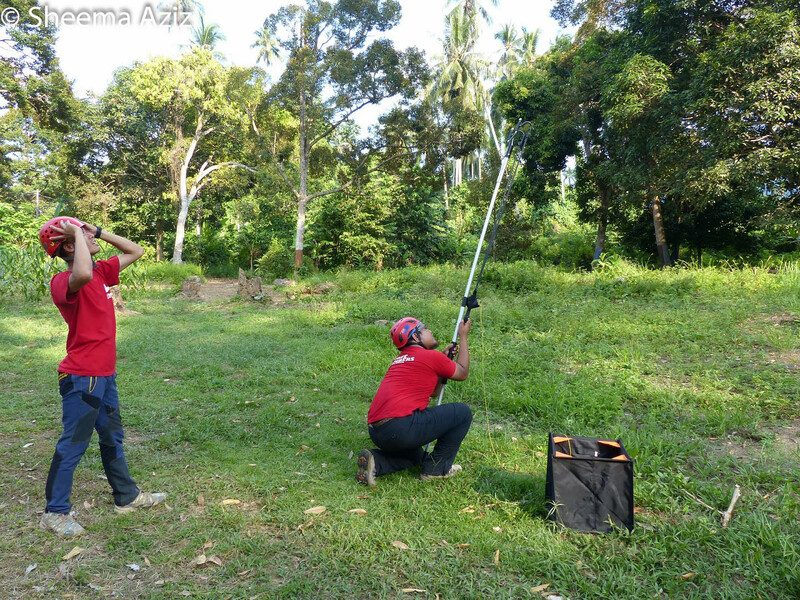 So we enlisted the services of Saifful Pathil and Muhammad Nur Hafizi Abu Yazid (‘Fizie’ for short! 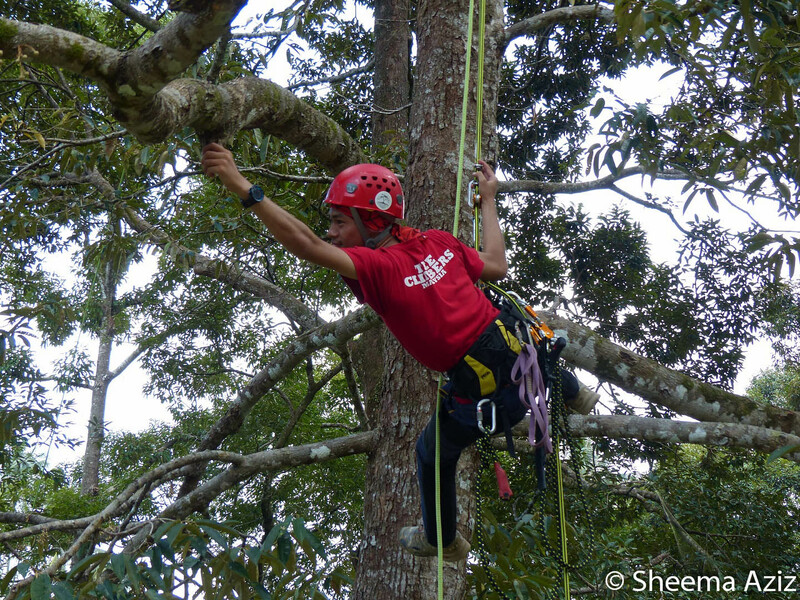 ), from Tree Climbers Malaysia. 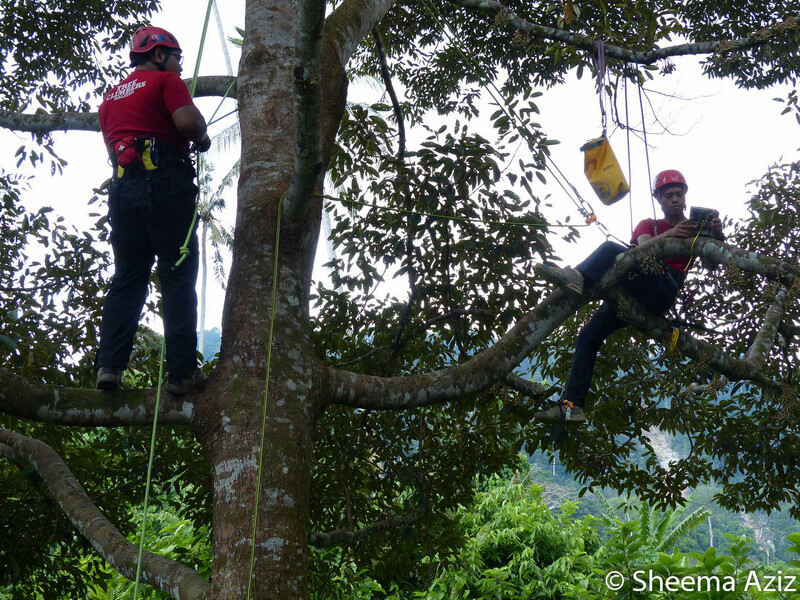 They are professional tree-climbers who are extremely well-trained in safe and effective climbing techniques, using high-quality climbing and safety equipment. So we knew right away that we were in good hands. We were also joined by Kim McConkey and her sons Sanjay and Ryan, who not only helped us out but were also loads of fun to have around! …it really is a long way up! …aaand he made it!!! 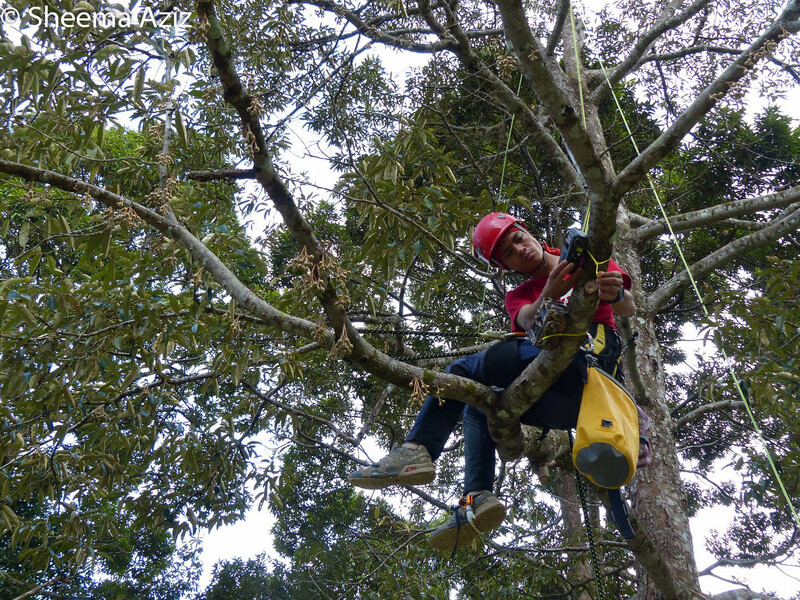 Can you spot where Fizie is in the giant durian tree?? …and you also need quite a bit of fearless dexterity! 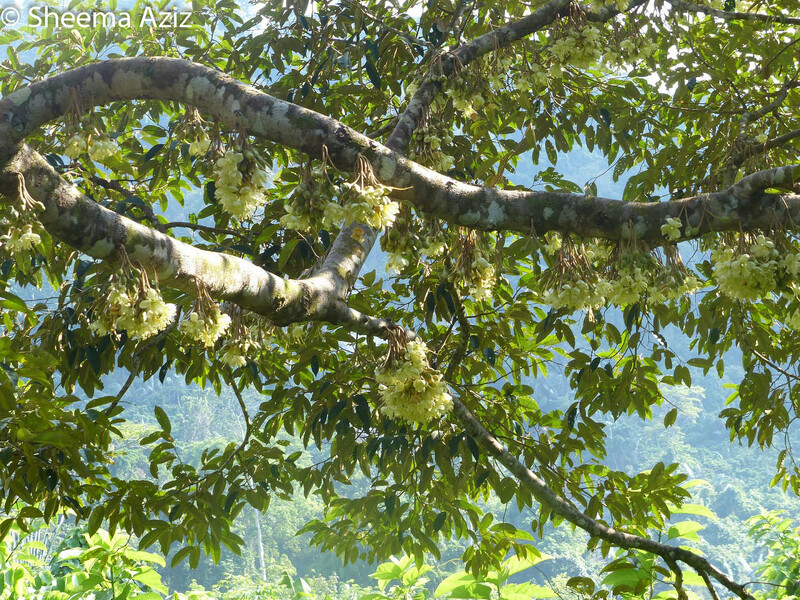 Beautiful bunches of durian flowers in full bloom. 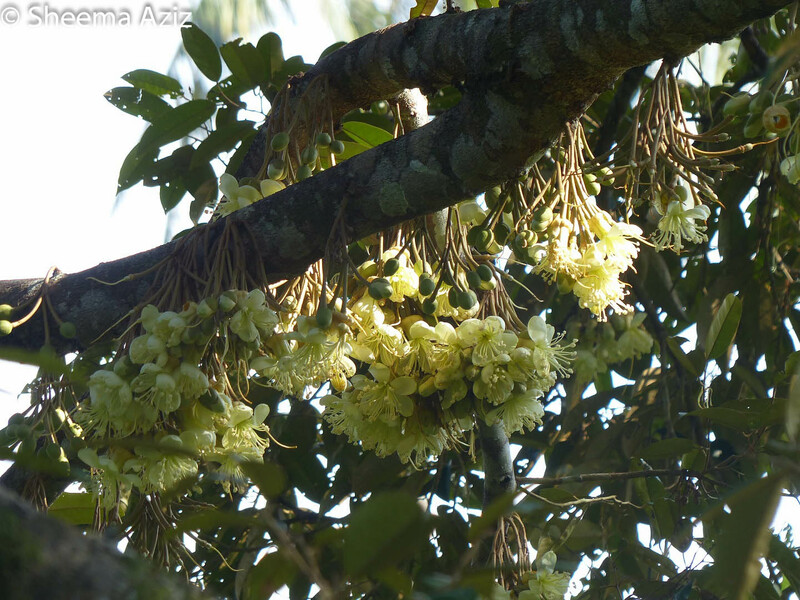 These night-blooming flowers were already open and secreting nectar by 4pm. 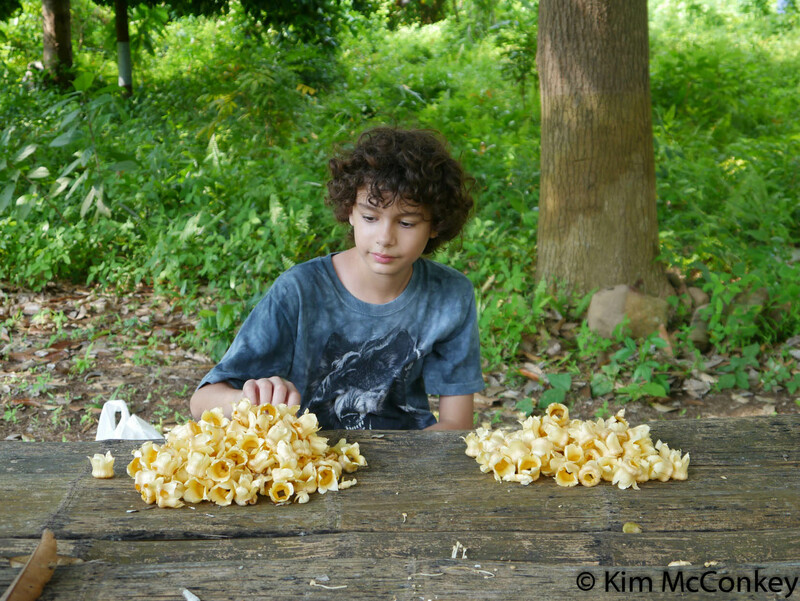 Fun fact: durian nectar tastes a little bit like sweet buttery popcorn! 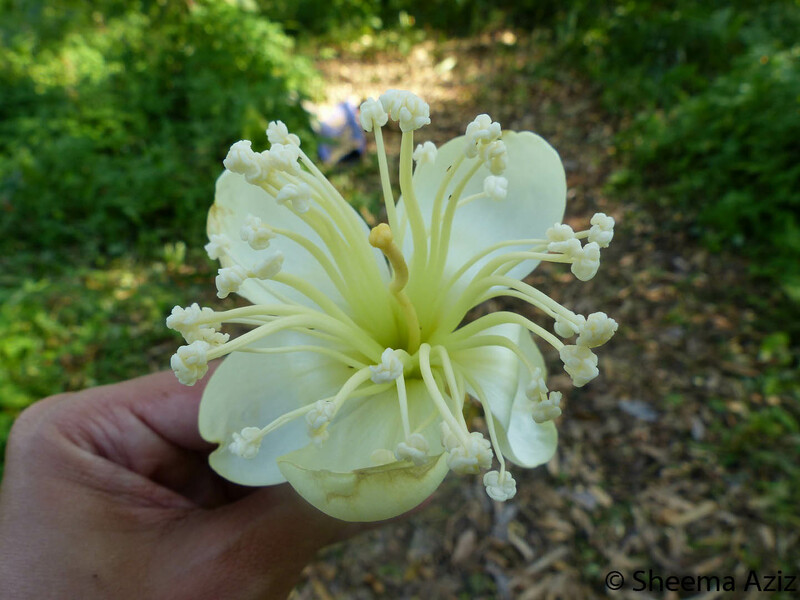 Sanjay made an interesting and important observation: holes nibbled into the bases of many durian flowers, made by squirrels who drink the nectar without performing any pollination! Stay tuned for more exciting updates, photos and even videos from Project Pteropus! Thanks so much for your support, Felicity, we really appreciate it! So happy to hear of this important and interesting project !